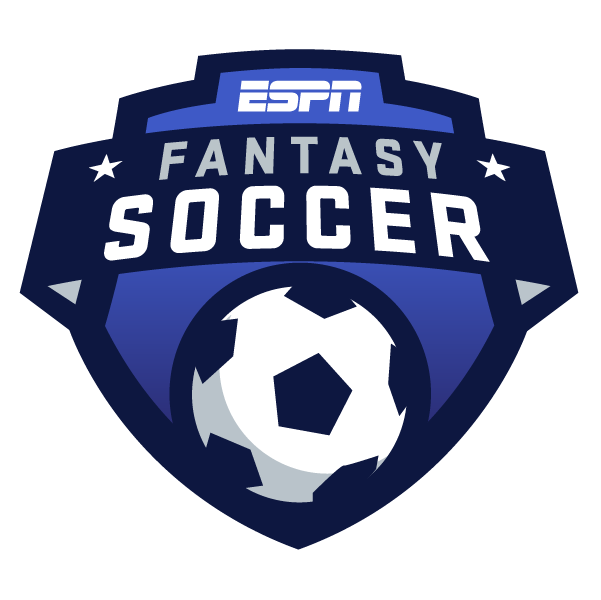 ESPN's new fantasy game is underway, but don't worry if you have yet to sign up. You can start whenever you want -- and that applies not only to our Premier League game but to the Champions League, La Liga and Liga MX too. As soon as you join and fill your league, your competition starts. To help you make up your mind about your eight-man team, we've enlisted the help of ESPN FC's Manchester City correspondent, Jonathan Smith, to pick out a player from each of the tiers. Every week, you'll submit a new team, or you can stick with the same eight but only if they are still in the same tiers. So make sure you're always checking and selecting the best team to beat your rival each week. Let's take a look at who Jonathan has picked for this weekend. And, just as importantly, why. Tier 1 forward -- Sergio Aguero (captain): The Argentine striker loves playing against Manchester United -- only Wayne Rooney has scored more goals than Aguero in Manchester derbies in the Premier League era. He has four goals in his last six Premier League starts and looked disappointed to only get only one against Southampton last Sunday. He's my captain. 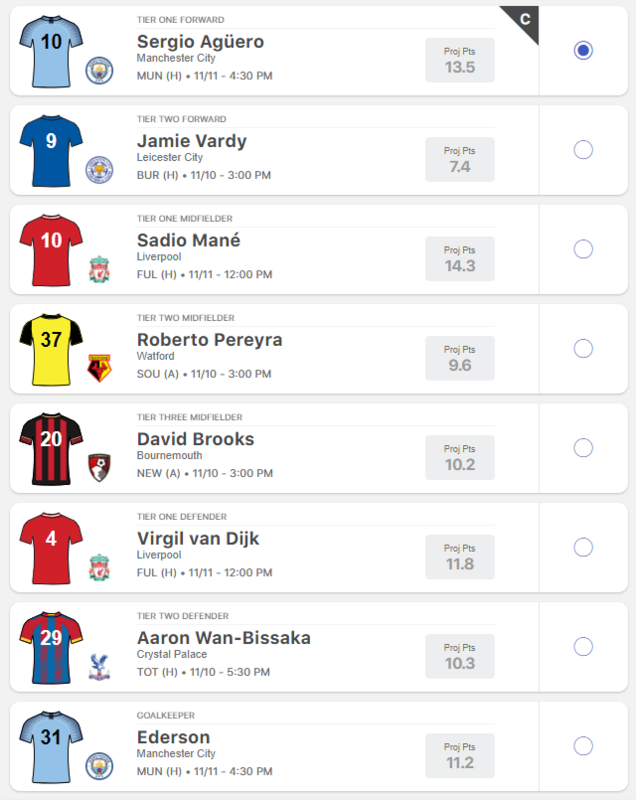 Tier 2 forward -- Jamie Vardy: Saturday's opponents Burnley are on a terrible run of form, having conceded 13 goals in their last three matches. Tier 1 midfielder -- Sadio Mane: With Mo Salah not quite hitting the extraordinary heights of last season, Mane has equalled him as Liverpool's most potent goal threat. He has seven goals already in the Premier League and will look to add more against a Fulham side lacking confidence after six successive defeats in all competitions. Tier 2 midfielder -- Roberto Pereyra: He has five goals already this season and has epitomised Watford's brilliant start to the season with his hard-running and attacking threat. He would have made it three in three last weekend had his strike against Newcastle not rattled back off the crossbar, and he will cause problems to a Southampton defence that shipped six goals last weekend at Man City. Tier 3 midfielder -- David Brooks: Bournemouth's good start has been helped by their dangerous counter-attacking style away from home with the tireless Brooks leading the threat. He has three league goals already this season, including two in the Cherries' last two away games and will fancy his chances of adding to his tally at a nervy Newcastle United. Tier 1 defender -- Virgil van Dijk: He has possibly been the Premier League's best defender since his move from Southampton and it's difficult to see the Liverpool defence being breached by a woeful Fulham side, particularly at Anfield where the Reds have conceded only once in the Premier League all season. Van Dijk is also a goal threat from set pieces and could have had a hat trick against Arsenal last Saturday. Tier 2 defender -- Aaron Wan-Bissaka: The 20-year-old has emerged as an exciting full-back at Crystal Palace with his energy to get forward. It will be a tough test against Tottenham, but the England under-21 international has a big opportunity to underline his huge potential. Goalkeeper -- Ederson: The Brazilian has the most clean sheets in the Premier League this season and had gone 629 minutes in all competitions without conceding a goal before he gave away a penalty against Southampton. Jose Mourinho may well set up his United side to defend at the Etihad Stadium on Sunday and Ederson will be looking for another blank.